In 2015 vendanges began on August 21st, in 2016 things kicked off on August 30th. The protracted cool spring and the drought contributed to a later harvest though not so late as predicted because of the hail on 17th August. This damaged some grapes especially in Sainte Suzanne (Metaierie) and Jeff decided that the grapes needed to be picked as they would lose acidity if left on the vine. On the 30th it was the Syrah which was picked, unusual for a vendanges not to start with white grapes. Syrah normally produces small berries but these were especially small. 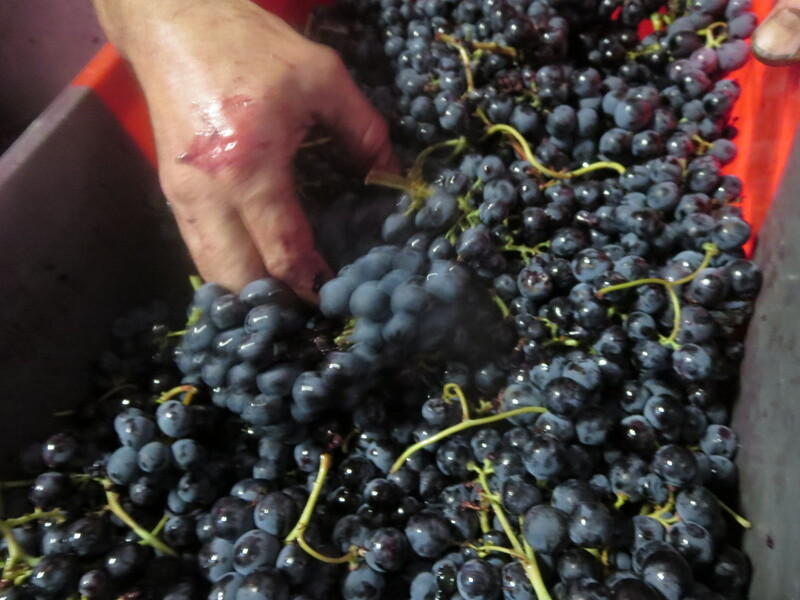 The cagettes in which the grapes are transported back to the cave are usually running with grape juice, requiring regular cleaning. Today they were virtually dry. Jeff calculated that the volume of juice produced was around half of the normal harvest which is not good news. Hopefully other grapes in other vineyards have fared better but we shall see. This is all the result of the protracted dry spell in the region. Rainfall, other than the occasional storm where the rain comes too heavily. has been pitiful. The vines have found it hard to cope and give water to swell the grapes. 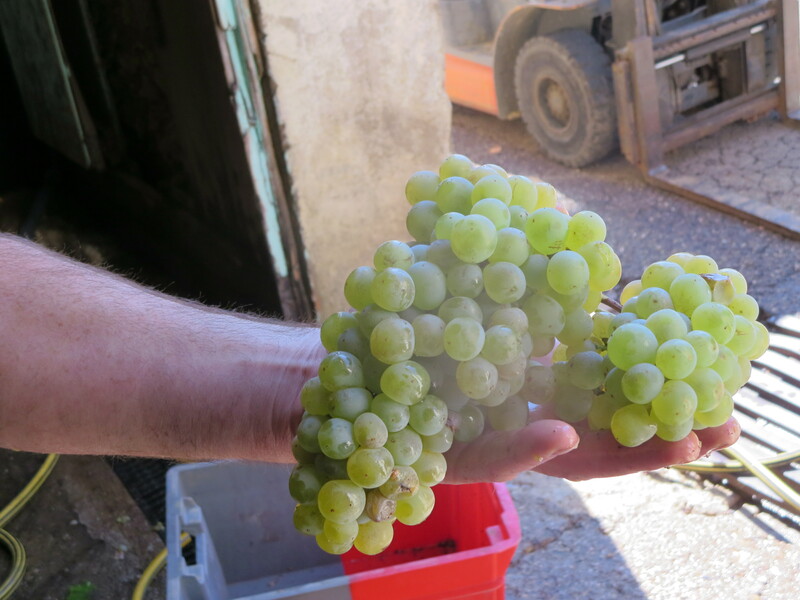 The hail confounded the problem by shredding leaves which would help to nourish the grapes. The good news was that the grapes gave lovely juice; fresh, very raspberry fruit and they smelled of beautiful warm spices. The measure showed potential alcohol of 12% so it will make a light, fresh Syrah wine or blend. There was a full house to help out. Michel, Julien and Vincent as usual. We were joined by James, an Australian who is staying for the harvest to help his learning for making wine in the future. Charles who spent a few days with us last year is also here for a longer spell, he adds humour and energy. Jeff’s primary school classmate Maylis was also present spending the day in the vineyards. And Céline, Brice and their two girls were here on the way back from their holidays, it is always fun to see them. One or two bits of machinery creaked under the strain of a new harvest but the changed cellar made cleaning so much easier. The team is taking shape for the challenges ahead. The Syrah sits in cuve 2A, I shall keep you up to date with its progress and path to the bottle. 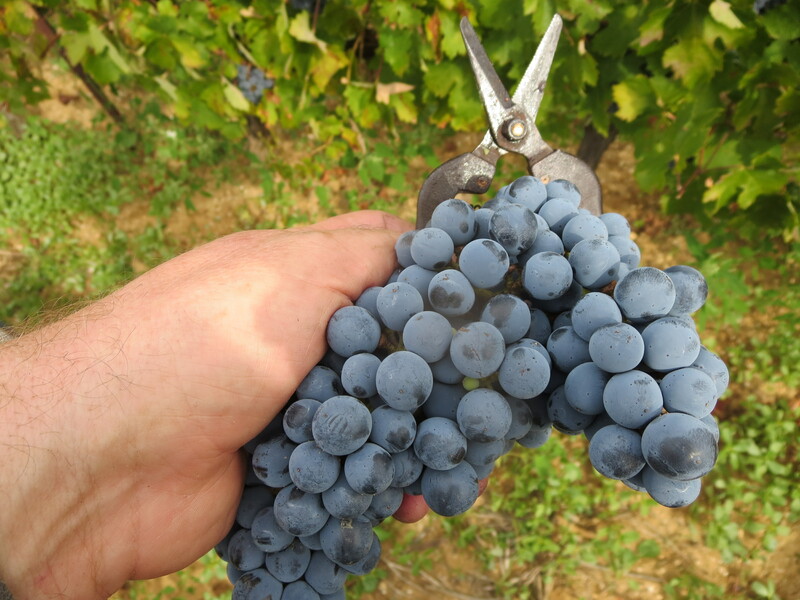 The last of the Syrah was picked first. If you look at the photo of the vines with James picking you will notice the lack of foliage and therefore why Jeff felt the need to harvest now. First official analysis of the Syrah from yesterday showed healthier than expected acidity and potential alcohol, a welcome fillip. Then came the Grenache from Ste. Suzanne, in many ways more problematic than the Syrah due to mildew earlier in the year. 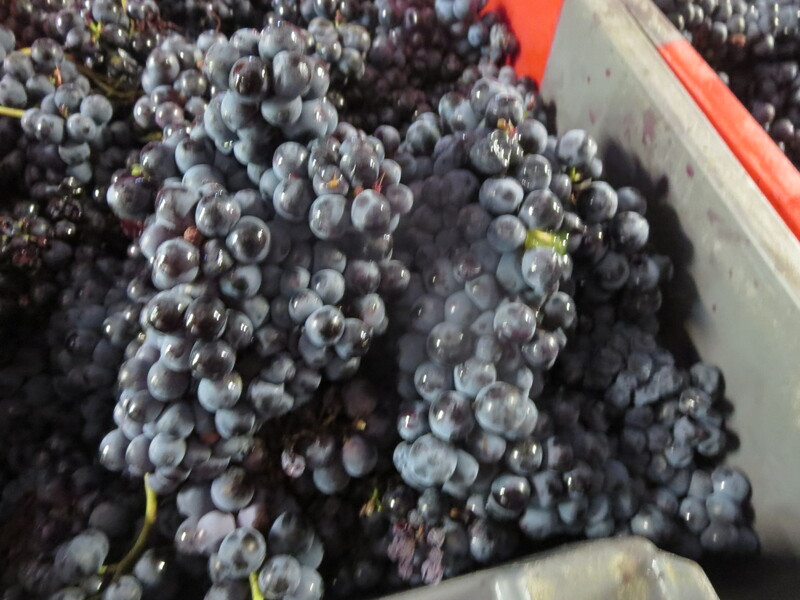 However, when it came in there were many good firm bunches of healthy fruit with possibly a little more juice than the Syrah. It was a very hot day so Jeff worked some magic by using frozen pellets of CO2 to stop the juice from starting to ferment too soon so that it doesn’t extract too much of the flavours of the dryer grapes before it is moved for the first time. 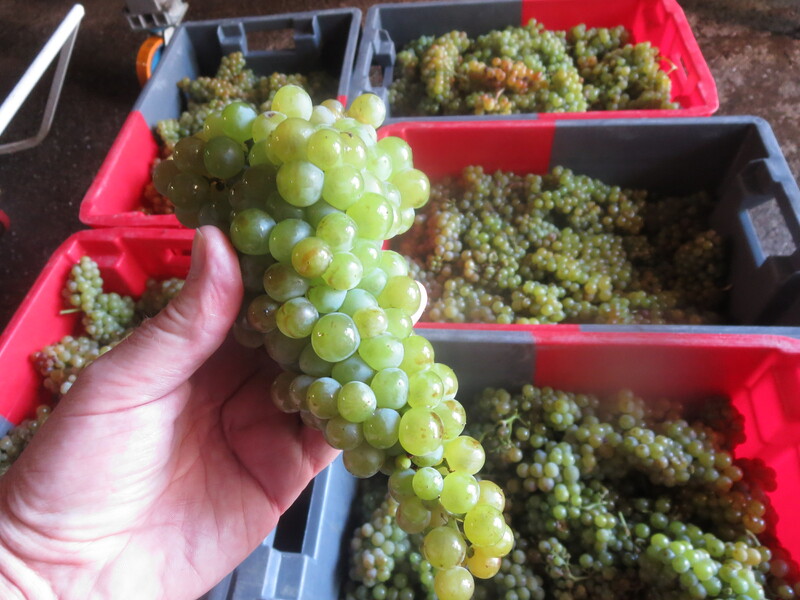 This was the first time that Jeff has tried this method due to the nature of the vintage and its drought. Difficult to take a photo as all you could see was the mist of the frozen gas. The juice tasted healthy and fresh with red fruits, a little vegetation still present. 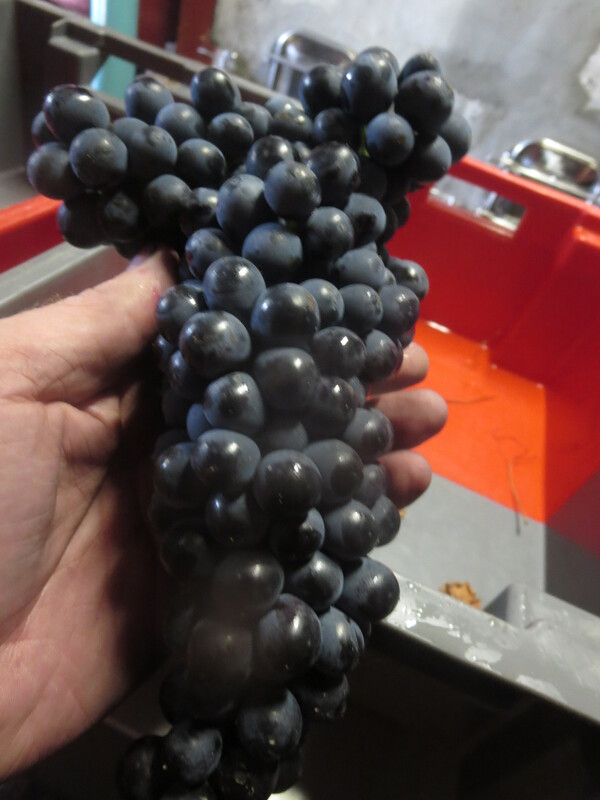 Yesterday’s Syrah was already darker, more weighty and very different to yesterday. Wine alchemy. It now sits in cuve 2B next door to the Syrah. Tomorrow (September 1st) is a new moon and so no picking or work. It is also the 2nd anniversary of my arrival in France, days like this remind me why that decision was a good one. Categories: Vignerons, Vines | Tags: égrappoir, Grenache, Mas Coutelou, Sainte Suzanne, Syrah, Vendanges | Permalink. There was something of the nautical in these two photographs hence the title. The preparations for the vendanges are in full swing, the hail has speeded up the start date as damaged grapes, especially, the Grenache in Sainte Suzanne, need to be picked earlier than foreseen. A tour of the vineyards on Wednesday morning with Jeff was an opportunity for him to taste the grapes and use the refractometer to measure the sugar and potential alcohol in them. 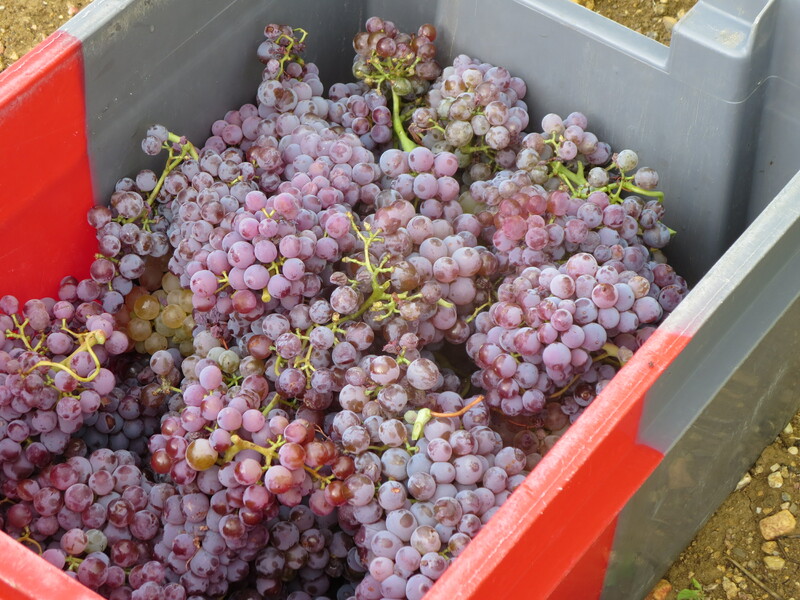 Picking will require even more care than usual in some parcels as the bunches will need to be checked thoroughly for any damage due to mildew, hail, vers de la grappe or any other issue. Many grapes will be left on the ground. The rest will be sorted back in the cave and Jeff has invested in a new sorting table to ensure scrutiny can be absolute. No chances will be taken as always, only healthy fruit will go into the wine. That is the how natural wines have to be, made from the healthiest fruit as nothing will be added to it to disguise faults, unripe grapes or unhealthy grapes. In similar vein everything has been cleaned down, washing equipment is a time consuming but vital part of ensuring healthy grapes. Harmful bacteria are the enemy, with no SO2 antiseptics we have to make sure that everything is spotless. And there have been plenty of other changes in the cellar to ensure that the winemaking will be top quality. Out has gone the old press and some big tanks (cuves) as I have mentioned before. In has arrived new stainless steel cuves, temperature controlled. There is more room, a new resin covered floor to make cleaning easier. Steel gantries have been erected to make it easier to access the cuves from above. This will make it easier for any whole bunch winemaking as the grapes can be put in tank much more simply and with more checks on quality. It will also be easier to carry out pigeage (punching the grape skins, pips etc down into the juice) and remontage (where the juice is pumped over the top of the cap of grape skins etc). A new staircase to the gantry makes life a lot easier and safer too. Some of the big cement cuves have been divided to enable Jeff to make smaller quantity wines which will offer more options at the time of assemblage. So, Monday. We are ready. The grapes will be ready. Let the vendanges begin. Categories: Vignerons, Vines, Wines | Tags: pigeage, refractometer, remontage, resin, sorting table, stainless steel, Vendanges | Permalink. 2016 has provided one problem after another. On Wednesday August 17th a hail storm hit Puimisson and the surrounding area. It was very violent and very localised, seeming to have taken a path from east to west across La Garrigue, Sainte Suzanne /Metaierie (worst hit) and on to Segrairals. The damage is obvious when you look at the vines: holes in the leaves like bullet holes; stalks bruised making the bunch unstable on the vine; grapes flailed, beaten and emptied or dashed to the ground. The amount of damage depended often on the direction of the vine row. Those planted east to west were damaged on the end but the hail fell mainly down the rows. However, those planted north to south faced directly into the hail and suffered damage especially those facing east, the direction from which the storm came. Thus if you look at the rows vegetation on one side looks thrashed, the other side looks normal. The damage means that the vendanges will start a few days earlier than expected as the grapes need to be harvested. Jeff sprayed the affected vines with a tisane of wild rosemary, arnica, propolis and tea tree. All of these are used to treat bruises and cuts in humans as well as plants. The idea was to help to heal the grapes and it seems to have worked well. After a year of no frost, drought, snails, mildew and vers de la grappe 2016 kept this surprise until late in the day. However, as Jeff said as we toured the vines, compared to others around Pic St Loup he got off lightly. Vineyards there were ruined by hail the same afternoon. The photos below show the horrific damage done at Mas Thélème in Pic St Loup. Indeed there was one benefit to the storm. 70mm of rain fell in an hour and the rain was much needed. The grapes have swollen with juice as a consequence and the amount of extra wine gained by the rain will more than compensate for the losses due to hail. Categories: Vines | Tags: grele, hail | Permalink. Friends Ceredig and Lesley were staying with us in Margon and our neighbours Martin and May had relatives and guests staying too so I thought it was a good time to organise a Mas Coutelou tasting. 2015: Carignan Blanc / Grenache Gris; PM Rosé; 5SO Simple; Buvette A Paulette; On Peut Pas Vraiment Dire Que; Le Vin Des Amis; Classe; Flambadou; Flambadou 2014; L’Oublié. Martin initiated a scoring system and at the end of the evening the results showed some agreement about the top wines but some differences too. Wine is personal and that is one reason why I am becoming more sceptical about scores generally. However, this was in fun and here were the results of the Anglo-Irish jury. At number 10, the Carignan Blanc / Grenache Gris. My fault this, I had a bottle from the first six off the bottling line and it contained a little water so came across dilute. However, there were some lovely apple and pear characteristics and it was a hit with one guest who doesn’t usually like white wines. I know from other bottles that this is a lovely wine which wasn’t done justice on the night. 8= PM Rosé An interesting result, perhaps showing that rosé finds it hard to be taken seriously (or just that people loved the reds). PM is so much more aromatic and punchy than most rosés that perhaps it confounded expectations. For me it is a cracking wine, with real character and heft as well as being bone dry and perfect on a summer’s evening. 8= 5SO Simple Another surprise for me as 5SO is really hitting its stride. I served it slightly chilled and everyone liked it though some found it too light for a red. I love the cherry bright fruits and clean finish, it is a great alternative to summer rosés. 7 On Peut Pas Vraiment Dire Que Liked by all, loved by some, a little austere for a couple of people. My opinion is changing on this wine. I thought it was a light Syrah which was for short term drinking but the last couple of bottles seem to suggest it is entering a phase of taking on weight and a serious side. Certainly I shall be keeping the rest of my bottles for a few years to see how it develops, I think it will become something special. It may not be La Vigne Haute but it is a serious Syrah of real quality. 6 Flambadou 15 Well liked though suffered by comparison with the 2014 which was more developed. There is an elegance to this, perhaps the best cuvée from Mas Coutelou in the last several vintages. Jeff likens it to Pinot Noir at time, there is a limestone layer beneath the fine clay soils of the vineyard and this seems to add the lightness and elegance. Red fruit aromas and flavours with a streak of tannins. This is very youthful and will develop with time, complexity is already there. A great wine from a great vintage. 5 La Buvette À Paulette Round, blackcurranty, juicy, very enjoyable. This was popular because of its sheer drinkability though some found it a little green. No doubt the Cabernet Sauvignon will develop further but this was on song already. It won’t be released until January 2017 and it is definitely one to wait for, a cuvée I hadn’t realised could be so good. 4 Flambadou 14 The extra year added more roundness to the wine making it more enjoyable in the short term. The extra complexity appealed to many of us as well as the red fruits. It is lovely though I do think the 15 will become better, being such a good vintage. 3 L’Oublié Another recently bottled wine which we assembled a few weeks ago. The aromas were immediately a sign of complexity, hints of tobacco, coffee, dark fruits, there are notes from the barrel and you can tell there is some older wine in here but there is also a freshness from the 2013 Cinsault. The story of the wine and its assemblage I wrote about recently and the air of mystery about L’Oublié added to its appeal at the tasting. 2 Classe No label on as this was another bottle recently put together and has not yet been prepared for sale. As soon as it was opened the exuberant fruits, blackcurrant and raspberry, almost leaped from the glass. There is a depth, richness and a darker profile in there too, this is one of the very best cuvées of Classe. Not hard to see why it appealed so strongly on the night with everybody. 1 Le Vin Des Amis Ever popular, ever first choice. When I serve Coutelou wines to friends it is almost always Vin Des Amis which is the most appreciated. The open, fruity nature makes it immediate and the complexity gives it a sense of being special. Which, of course, it is. It really was on good form here and a clear winner on the night. A great evening. Lovely people around a series of great bottles, how could it not be? And wow those wines are great, hopefully more people converted to natural wines and to Jeff’s in particular. A word to for the 2015 vintage. I am, of course biased as this was my first full vintage, but it is proving to be top class, everything is drinking well and the bottles still to come will highlight its class still further. Categories: Tasting, Wines | Tags: 5SO Simple, Carignan Blanc, Classe, Flambadou, Grenache Gris, L'Oublié, La Buvette A Paulette, Le Vin Des Amis, Mas Coutelou, On Peut Pas Vraiment Dire Que, PM Rosé | Permalink. Back in the Languedoc and, the first morning, I went over to see the vines. Jeff had sent me a message that they were in real stress because of the lack of rainfall. Ironically we had driven south through France under leaden skies and through fairly steady rain, until we reached the Languedoc where the skies turned blue and the temperatures rose. It has been very hot here throughout the three weeks I was away and, following a very dry autumn last year and not much rainfall in 2016, the vines are definitely in need of a good drink. I have written many times this year about the vine stress due to very unusual seasons, the warm winter, cool spring. Sadly, summer has also added to their difficulties. Sure enough the vines look dry. The apex of the vine is often a good way to tell their health and they look tired and bare, almost burned. To safeguard the health of the young, newly planted or grafted vines Jeff and Julien were busy watering them in the Flower Power vineyard, Font D’Oulette. This is allowed as they are not grape producing this year. Straw was then placed around them to keep the moisture inside. Julien showed his dedication by doing more of this work at night time. Even Icare was feeling the heat despite his haircut, he kept hold of the stick when it was thrown as if to say I’m not chasing after this anymore. Jeff also informed me of yet another problem, ver de la grappe. This is the larvae of a moth which feeds on the grape. I took a photo of an affected grape last year. There are chemical treatments available to prevent and to treat the problem, no use to an organic producer of course and these chemicals are especially harmful, you can’t use the grapes until 21 days after spraying. So, for Jeff the treatment involved spraying clay onto the vines to try to make the grape skins less attractive to the moth so it will lay the eggs elsewhere. This was only the second time in twenty years that he had sprayed against ver de la grappe. Also in the spray was fern and seaweed, the fern is a natural insecticide and the seaweed gives a health boost to the vine. However, having sprayed this morning (July 31st) Jeff was hoping that the much needed rain would hold off for a couple of days to allow the spray to work. You can guess what happened next. A storm, heavy rain, much of the spray washed off the grapes. It is that sort of year, nothing seems to be going right. The rain which did fall was minimal and only undid the good work. The worst of all worlds. To spray or not to spray? To rain or not to rain? Caught between a rock and a hard place. 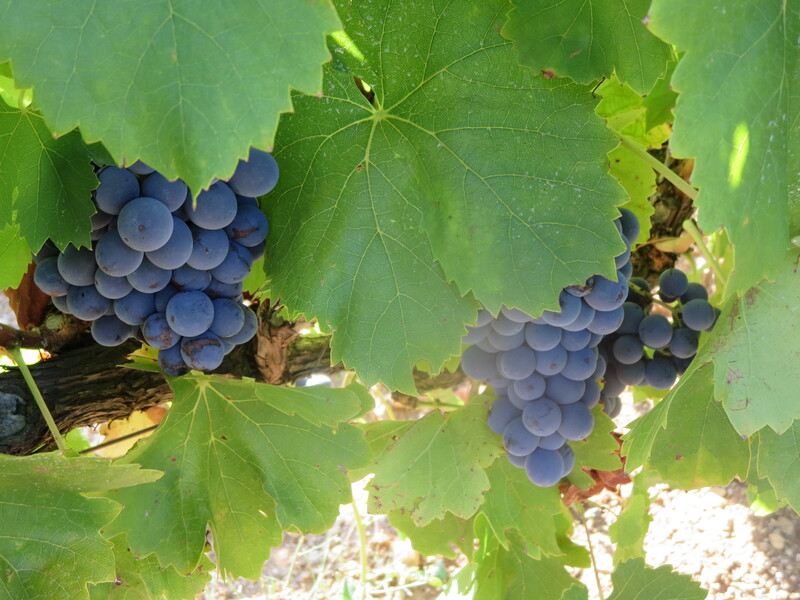 As I made my way around the vineyards there were plenty of good grapes to see, véraison (the changing colour of red grapes) has begun especially amongst the Syrah and Grenache of La Garrigue. And I spent some time in Rome, a very parched looking vineyard but the ideal place to reflect upon its creator, Jean-Claude. There are some things to be thankful for even in this difficult year. Categories: Vignerons, Vines | Tags: algues, argile, clay, fern, Flower Power, Font D' Oulette, fougere, Grenache, La Garrigue, Languedoc, Mas Coutelou, rainfall, Rome, seaweed, Syrah, véraison, ver de la grappe, vers de la grappe, vine stress | Permalink.